(CNN) – Kenya swore in its new president on Tuesday. Uhuru Kenyatta is the nation's fourth and youngest president. He follows in the footsteps of his father who was the nation's first president. [:16] "There's a long history of Kenyatta. That would be in a sense equivalent to I guess the Kennedys in the United States." 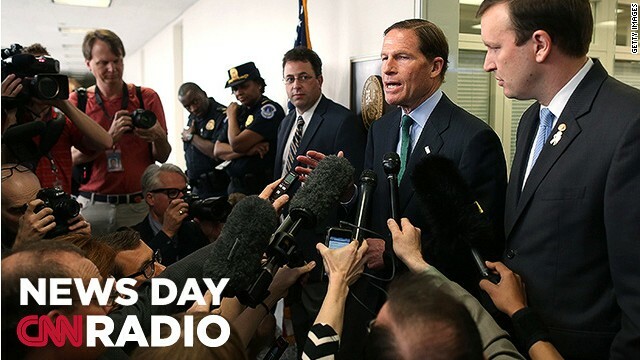 Connecticut Senators speak to the media after meeting with families impacted by the Newtown tragedy. Congress: Better than it seems? Washington (CNN) – Gun legislation is locked in negotiations behind-closed-doors. As is immigration reform. The most frequent public activity for Republicans and Democrats in Congress remains criticizing each other. And yet, there is a chance that Congress may be slowly getting more done, or at least avoiding gridlock, than in the past few years. – Olympia Snowe, former Republican Senator and current chair of the Bipartisan Policy Center’s Commission on Political Reform. CNN looked through the past three months of votes in the House and Senate and discovered that of the major measures that received final votes, many passed with substantial bipartisan support in both chambers. What Snowe and others hope is a sign (if a modest one) of progress, others see as simple maneuvering.